The Fundraiser that Parents Actually Enjoy! Parents will choose memes like this to share on social media and through email. Give us some basic information about your school or organization. Add your classes/groups and you’re ready to go! The system will generate the Activation Letters for each student/member and once the parents log in, they can start sharing! Parents/Students will enter 10 emails of Family and Friends to send a funny meme to and get a prize. 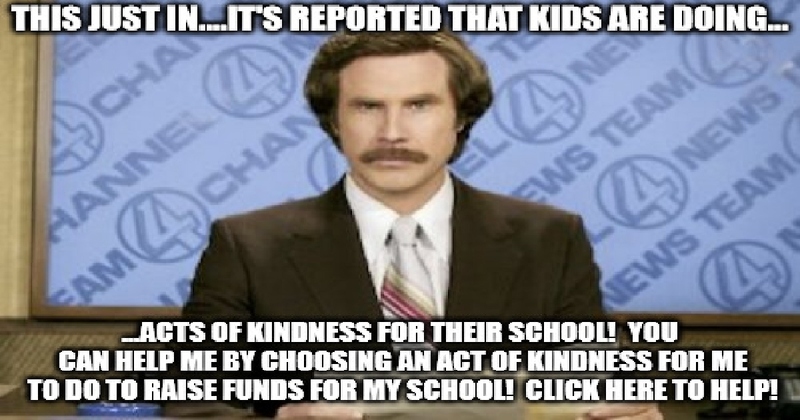 Loved ones will gladly choose an Act of Kindness for the student to do, and will sponsor them by donating! It will only take them 5 to 10 minutes to finish the fundraiser!!! Then they can share on Social Media if they wish. So easy! 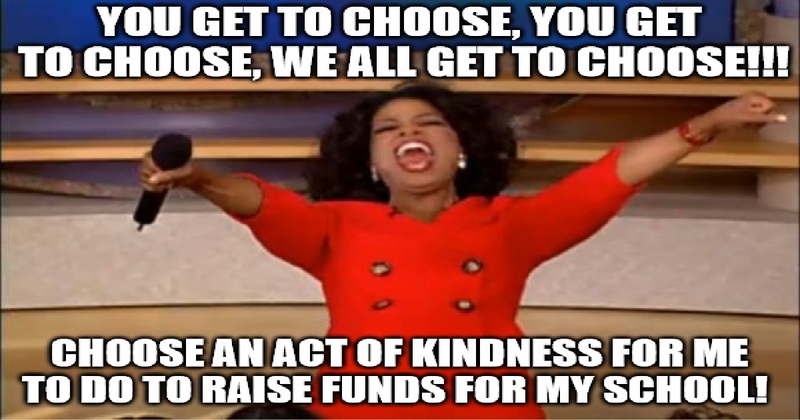 When people choose an Act Of Kindness and sponsor that student, funds are coming in for your school! 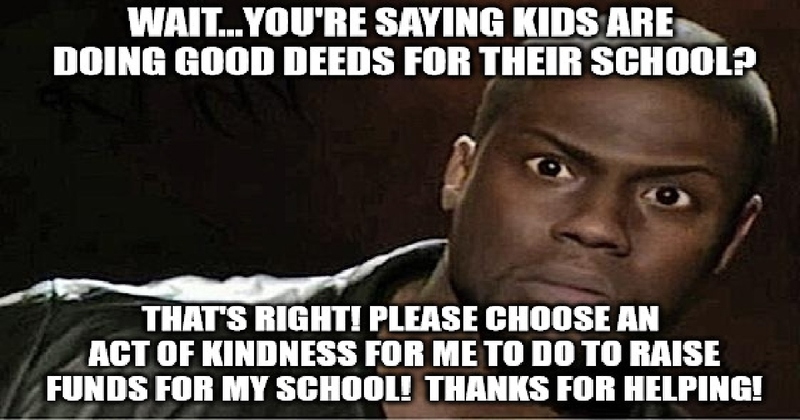 At the end the student gets a list of Acts of Kindness, does them, and you are finished. Simple! Show Me The Acts of Kindness! 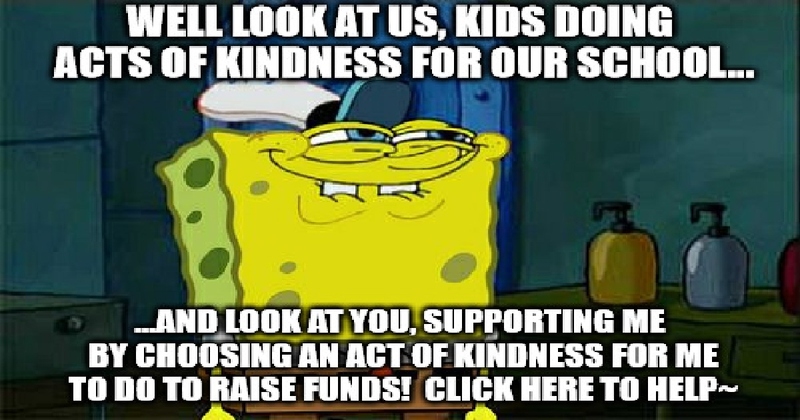 What if you could raise the money your school needs by sharing positive memes instead of selling over priced fundraising products? Well now you can! Running a Share-a-thon through your school or other organization is free to start, requires minimum to no volunteers, and you get to keep more of the money raised. And if you share with other groups, you can raise even more money. It really is an easy and rewarding way to fundraise. Click the “Get Started” button below to get started today or to schedule your fundraiser for a later date. 10 Days of Character Building! Day One: Teaching Generosity and a willingness to prefer others above self. Day Two: Teaching on assisting friends, teachers, parents, and people in need. Day Three: Students learning how to lift up each other with praise of accomplishments, compliments, and encouraging words. Day Four: Students learning not only how to give respect, but the fact that to Gain respect, it must be earned, not just expected. Day Five: Teaching how to expect the best from yourself and others. Know that everyone can do better if they try. Day Six: Students learn that “Whether you believe you can, or you can’t….you are right”. Attitude is everything. Day Seven: We need to be thankful for what we have and who we are, even as we strive to do better for ourselves and others. Day Eight: Learning about the importance of being honest, even when it hurts. Day Nine: Students learn to always keep their chin up, and look at the bright side! Day Ten: Teaching Students about Perseverance, and the importance of knowing that if you just give it your all, you will never regret it! Use the sliders to calculate how much you can raise by adjusting how many students you have and how much each student can raise. OK so how much money do YOU actually get? Every group starts off at 70% profit, we provide the Share-a-thon Incentive Prizes and pay for credit card processing. No hidden costs. Your profits will go up as you share Share-a-thon with other schools or organizations and they raise funds with Share-a-thon. You will make a 10% Share Fund from the proceeds of referred fundraisers. Our sharing concept could allow your overall profits to exceed 100% of your original Share-a-thon campaign. Pretty simple, pretty awesome, and all about sharing! 70% goes to your school or other organization! No hidden costs or fees like credit card processing fees. 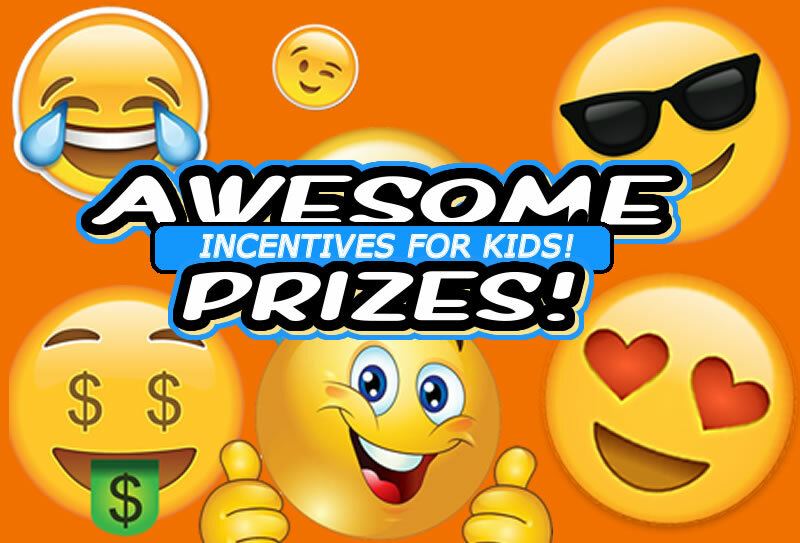 We include a prize program for elementary schools! You don’t pay anything extra for them! Click the tag above to see our current incentives! Using our sharing tool, share Share-a-thon with other schools and organizations and your profits can skyrocket. Want to learn more about your Share Fund? Sharing is fun and profitable. Click the button below to find out more. "One of the easiest ways to raise money for our school!" "Raising money online is the future of fundraising. Im so glad Share-a-thon is here!" SHARING– Day One: Teaching Generosity and a willingness to prefer others above self. HELPING – Day Two: Teaching on assisting friends, teachers, parents, and people in need. APPLAUD – Day Three: Students learning how to lift up each other with praise of accomplishments, compliments, and encouraging words. RESPECT – Day Four: Students learning not only how to give respect, but the fact that to Gain respect, it must be earned, not just expected. EXPECT – Day Five: Teaching how to expect the best from yourself and others. Know that everyone can do better if they try. ATTITUDE – Day Six: Students learn that “Whether you believe you can, or you can’t….you are right”. Attitude is everything. THANKFUL – Day Seven: We need to be thankful for what we have and who we are, even as we strive to do better for ourselves and others. HONESTY – Day Eight: Learning about the importance of being honest, even when it hurts. OPTIMISM – Day Nine: Students learn to always keep their chin up, and look at the bright side! NEVER GIVE UP! – Day Ten: Teaching Students about Perseverance, and the importance of knowing that if you just give it your all, you will never regret it!